A small stone which fell in either 1911 or 1912, but became known to the scientific world over seven decades later is one of only 16 known Howardite falls. Its primary constituents are a ~ 2/1 mixture of a Eucritic pigeonite-plagioclase intergrowth compounded with Diogenitic orthopyroxene. All Howardites are brecciated mixtures of Eucritic and Diogenitic materials, but Erevan is somewhat unusual in this regard. In addition to its somewhat extreme range in pyroxene, plagioclase, and (even) olivine compositions, it has an unusually diverse set of exotic clasts. Carbonaceous, glassy, and even Angrite-like clasts and xenoliths are found as well as small and comminuted Eucrite and Diogenite clasts. Consequently, in addition to the several silicates and opaques we usually found in Howardites, there are also small amounts of carbonates and phyllosilicates which we do not usually find in most Howardites. As a curious consequence Erevan and Jodzie, the two least massive Howardites, rank among the 3 or 4 top Howardites in mineralogical diversity. Current thinking is that almost all Howardites (as well as almost all Eucrites and Diogenites) are likely fragments derived from ancient impacts which stirred up the crust and upper mantle of the asteroid 4 Vesta and eventually blasted large amounts of material into space. Subsequently time, more collisions, and gravitational circumstance eventually brought a small portion of the ancient ejecta to the planet earth. There is nothing in the above record which is inconsistent with Erevan being an HED meteorite (Howardite-Eucrite-Diogenite) whose Original Parent Body was the asteroid Vesta. Erevan even shares a ~20 million year cosmic ray exposure age with several other HED meteorites, further suggesting a shared HED history. However, there are clear indications that a few, at least, of the HED stones in our collections had separate parent bodies (Cf. recent references provided below). So, for now, there is still plenty of work to be done before we can start assigning definite Original Parent Bodies even to such apparently 'normal' HED meteorites as Erevan. Kvasha, L. G., Skripnik, A. Ia., Diakonova, M. I., Kharitonova, V. Ia. & Levskii, L. K. (1978) The Erevan meteorite. 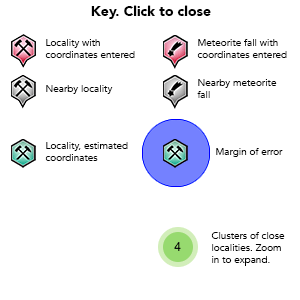 Meteoritika: 37: 80-86, 257-260. In Russian. English abstract available. Grady, M. M. (2000). Catalogue of Meteorites (5/e). Cambridge University Press: Cambridge, New York, Oakleigh, Madrid, Cape Town. 690 pages.